When we first caught word that the Raspberry Pi Foundation was coming out with a new camera, we were excited to see the camera-based projects that would come out of this $25 peripheral. We're finally starting to see some projects, including the big one: sending it to space. 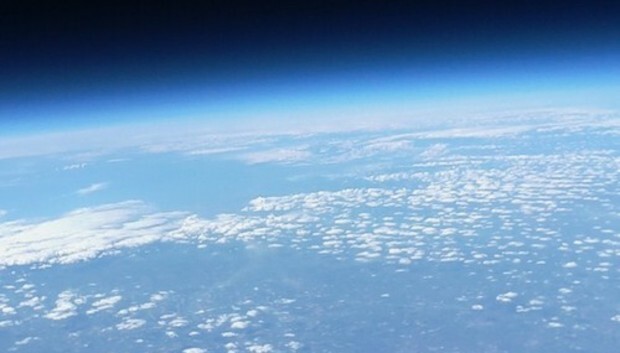 High-altitude ballooning expert Dave Akerman recently sent his $25 camera module and Raspberry Pi to the edge of space in a mission called the Sky Project in order to nab some photographs of Earth and beam them back. Dave originally started the project nearly a year ago when he built a tracker using a Model A Raspberry Pi and a pre-production unit of the Pi camera. To get his Pi combo to actually take decent photos in space, Dave switched the Pi camera to capture images in matrix metering mode. He also programmed it to snap three sets of images every minute, while discarding any photos that just captured the blackness of space. The camera system is also hooked up to a Raspberry Pi and two radio transmitters that allowed the Sky Project to beam back small- and medium-sized versions of the photos 320by176 and 512by288 pixels, respectively). The camera also saved a large format image to an on-board SD card. Before sending up the whole thing last weekend, Dave housed the entire setup, along with a couple of batteries, in a foam replica of the Raspberry Pi logo. In the end, the mission was a total success--aside from veering way off its projected flight path--and Dave now has a huge library of beautiful images of Earth. While it's not the first time we've seen a hobbyist send a camera to the edge of space, at only $25, the Raspberry Pi camera is way cheaper than any other video camera out there--or even a typical Android phone. Be sure to check out Dave's blog for a super-extensive guide on the entire build process, a recap of the launch day, and even more images the Raspberry Pi took in space. « Did the new Arrested Development make a huge mistake?